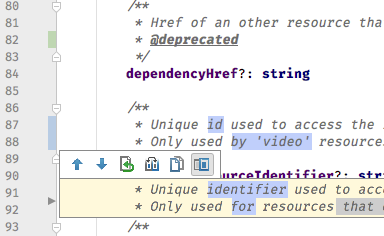 In WebStorm (and also Eclipse, Netbeans), when clicking on the git diff indicators in the gutter, a contextual menu shows the previous content, and provides a button to quickly revert the block modifications. But I didn't find how to quickly see the corresponding diff. I can't believe there's no quick way to see what the gutter indicators refer to. Did I miss something? Is it an upcoming feature? Or would someone know about an extension that would add that behavior? There currently is no such feature. In general, you should not expect some random feature from one IDE to exist in another editor or it being an “upcoming feature” just because some parts of the UI looks similar. In almost all situations, this won’t be the case. However, in this case, there is actually some kind of work going on, as can be seen in issue 10782. You can follow the progress there, or even try to contribute to make it land quicker. Interestingly, for Visual Studio (not Code), there’s actually an extension that provides this functionality: GitDiffMargin. It appeared in Visual Studio Code 1.18! They call it Source Control Inline change review. By the way, they also added coloration over the modified files in the file explorer. You can install awesome GitLens — Git supercharged extension which provide all the functionalities. Not the answer you're looking for? 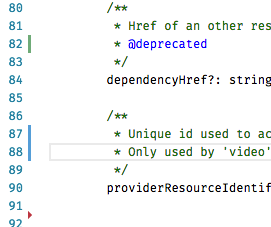 Browse other questions tagged git visual-studio-code diff or ask your own question. How to exit git log or git diff?